A common sight on the streets of Rome in the late empire was abandoned children. The economy was in a bad way. Taxes were rising. Many parents simply gave up the struggle of trying to cope with another mouth to feed. It is a harrowing thought to think of the suffering involved, both on the part of the abandoned children and the desperate parents. But there was some help at hand. Valentinian was a brutal badly educated tyrant. If he didn’t like you, he’d kill you. But deep down he had some well buried human compassion that as ruler of the world he was able to indulge. He was so distressed by the sight of abandoned babies in the capital that he set up state funded care for them – 14 physicians were maintained to look after them in various quarters of the city. There is something rather touching about a man whose life work was killing people showing this care for the weak and defenceless. And there was another surprise. He was also keen on promoting education even though he had none himself and set up centres of learning throughout the empire. The strict military disciplinarian was still evident in that progress was expected to be positive, with corporal punishment or expulsion for poor performers. Gibbon considers this approach to be the forerunner of the discipline of a modern university. Was this the origin of marks, grades and examinations? I am not so sure but it is an intriguing thought. So for all his strictness, Valentinian did take his duties as a ruler seriously and indeed showed some creativity in what his government did for the people. Providing benefits is always the easy bit of course. Paying for them is the clever part of governing well. This is still true today and will probably always be true. But it was even more the case in the late Roman Empire where all the wars were defensive so only the internal resources of the empire were available. We also have to remember that in the days before the exploitation of fossil energy, the balance between public and private expenditure was very much a zero sum game. All the wealth of the empire was created by human or animal muscle, and if the legions were to be fed let alone paid someone somewhere had to haul the logs and draw the water. The legions were an absolute necessity in a violent and dangerous world, but other areas of expenditure were more discretionary. So it is impressive to see Valentinian and his brother keeping a close eye on the cash and not running a lavish courts along the lines that Constantine and his sons did. His economical approach meant Valens was able to reduce the taxes in the Eastern half of the empire. 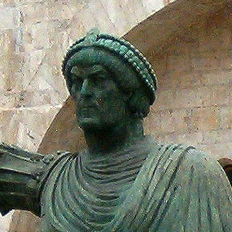 The economic base of the West was less robust and Valentinian was faced with tougher military requirements, but even he was able to not put up taxes. So for the average citizen, whose tax burden had been increasing for the previous forty years, the regime was probably tolerable. The state took a lot, but it did provide something for it and it was effectively protecting them from the barbarians over the border. Valentinian had shown some courage in the reign of Julian by criticising his move to paganism. This wasn’t life risking courage, Julian was not that kind of emperor. But he did put himself at a disadvantage for promotion, which is not an insignificant thing. In the event this act of religious principle turned out to be a bit of a one off in Valentinian’s career. If Christians had backed him in the hope that he would turn out to be a partisan for their cause then they were to be disappointed. He showed little interest in Church matters and certainly did not get involved in the factional rivalries that obsessed so many. As it happened, the bulk of the Christians on his patch in the West were orthodox trinitarians. As there was not much internal conflict they could concentrate on establishing their position. But Valentinian did take an interest in what the Church was up to. He brought in several controls on the activities of its members. For example he banned the practice of allowing the priests to accept bequests in wills. His thinking on this hasn’t been recorded. Gibbon assumes it is a simple matter of justice. The clergy were preying on people with ample fortunes, particularly women,and offering prestige in this world and favour’s in the next in return for leaving their worldly wealth to the Church. It was soon to be useless to them after all. There may have been a bit of a more pragmatic motivation for Valentinian. Transferring wealth away from the secular part of the economy would have reduced the tax base given the exemptions enjoyed by the Christians. This might have been the first stage in a fight back of the government against the growing influence of the Church, although it is probably more realistic to see it as simple cash flow management. In the East the religious situation was far more complex and Valens seems to have been a bit out of his depth at dealing with it. He may well have intended to follow the same basic policy as his brother, of being generally pro-Christian in a non-factional way while tolerating other faiths. It would have been good for the long term survival of the empire if its inhabitants could simply have got along with one another, so you can see why the emperors would be in favour of toleration. But it didn’t look that way a bit lower down the food chain. There are two great motivators in human behaviour – greed and fear. The men in charge of the winning team in the religious marketplace could look forward to great rewards. And being on the losing side meant you could end up as part of a persecuted minority. It is no wonder that the Christians spent most of their time looking over their shoulders at their rivals. A bluff and effective soldier like Valentinian was probably immune to the subtle intrigues of religiously motivated courtiers, but the more suggestible Valens could be worked on. He would end up getting dragged into the battles between the Arians and the Orthodox, even though he may well have had only the haziest notion of what the argument was about. As always, Egypt figured large in the controversy. Egypt had long been a discontented province. Egypt was the bread basket of the Eastern half of the empire, which meant that Egyptian labour and resources were exploited for the benefit of other places. It is not hard to see how that would cheese off the Egyptians. Throw in some religious disputes and the bubbling stew could easily overflow. Valens seems to have stumbled into this hornet’s nest more or less by mistake. As chance would have it, the current Archbishop of Constantinople was an Arian. Valens decided to get baptised prior to a campaign against the Goths, and so became technically aligned with the Arian party. He also exiled some Orthodox clergy, who were subsequently burned to death when the ship carrying them away caught fire. A conspiracy was suspected. But there was no general persecution of the Orthodox. The biggest indication of the basic tolerance of Valens is that Athanasius was allowed to carry on in Alexandria as Archbishop and arch trouble maker until he died of natural causes. The leadership of the Orthodox faction then passed to Saint Basil in Cappadocia, who was not only permitted to hold his position but was given imperial grants for a hospital project. Basil showed his gratitude by sending Valens a letter pointing out the grave errors of his Arianism. I guess that is bishops for you. Valens had more to worry about from the activities of the faithful than from their arguments. The vacancy for Archbishop of Alexandria created by the death of Athanasius was filled by the appointment of an Arian. This was actually done by the governor of the province of Egypt who was a pagan – his motivation hasn’t been recorded but continued tolerance of paganism might well have been in the mix. This set up a potential conflict between the new appointee and his disgruntled flock who regarded him as a heretic. Alexandria was soon to become notorious for the regularity with which riots would break out. They really seem to have been at it all the time, with every faction ready for a fight at a moment’s notice. It isn’t hard to forgive Valens for being baffled by the religious controversies of his day – frankly they would baffle anyone. If he was later to be criticised by partisans, well that was probably unavoidable. There was no way to please everybody. The situation was a fluid one and the relative strengths of the different parties must have been hard to keep track of. One of the big strengths of the Orthodox party was their monasteries. It would be as well not to think of these as being anything like the monasteries with which we are familiar today. The militant madrasas of modern day out of the way places like Pakistan are probably a closer approximation. The shop front of the church was its network of congregations. These provided a means of communicating their message, making recruits and raising money. Monasticism was the next stage in building the organisation. It provided the Church with fultime manpower, and the ability to produce the literature it needed. It was this infrastructure that counted in the bid for power. The ability of Athanasius to go into hiding and lay low until the situation became more favourable is a good example. The frequent disturbances in Alexandria were no doubt often co-ordinated to further the interests of the factions, and the ability of the Orthodox faction to summon up numbers when needed must have given it a key advantage. The two factions differed not only in their theology, but also in their strategy. The Arians seemed to have concentrated on working with the state, while the Orthodox built their own organisation. Both approaches had advantages. The Arians were more light on their feet and did not pose a threat to the state’s institutions. On the other hand the Orthodox could weather changes in the regime more effectively. I wonder if the educational and social reforms undertaken by Valentinian were motivated by a desire to rival, or at least not become dependent on, the growing organisation of the Church. Valens definitely found himself coming into conflict with the monasteries, and pretty directly. The exemptions from taxes and military service enjoyed by the monks were quite appealing. There was an obvious temptation to give oneself over to the monastic life, but to keep your more worldly interests going as well. Valens tried to close this loophole. A force was sent to monasteries in Egypt with orders to clear out the hangers on. The mission was subverted by some Arian clergy who accompanied it and who managed to get the soldiers to go beyond the letter of their orders and to press into military service all the monks young enough to serve. To give an idea of the scale of this operation, just one of the monasteries had 5,000 monks on its books. The whole operation turned violent and many people were killed. This was long remembered as an Arian atrocity committed against the Orthodox. But if anything both Valens and Valentinian were erring on the side of being overcautious. The Church was becoming a significant power in the state and was beginning to act like it. Resources were increasingly being diverted into non-productive activities reducing the scope for action of the civil government. It was already possible for a pagan to jokingly confess that he would be willing to convert if he could have the job of the Bishop of Rome. The huge wealth under the control of the Pope is still something that has the power to scandalise even today. When Gibbon was writing the Pope was literally the ruler of the largest state in Italy and probably the most wealthy ruler in Europe. But as early as the fourth century it was already a plum job. Why were men so interested in theological differences? The huge rewards of getting it right must have had something to do with it. Praying for the empire was both a lot more lucrative and a sight safer than fighting for it. The lust for money and power even today endanger secular states today and in the past. The only real concern of Religions is their self centered intrest and not of the societies they reside in. I have to agree with you there Marcos. And there is no better illustration than the story told in the History of the Decline and Fall of the Roman Empire. It is one of its major themes.